As is tradition when musicians stop by the GOT set, Sheeran gets a few seconds to show off his singing voice, debuting a little ditty that came Arya-approved. Though his character told her it was “a new one,” the song he was singing, unofficially titled “Hands of Gold,” is taken directly from the Song of Ice and Fire books. (It’s no “Shape of You,” but what is?) It popped up in A Storm of Swords, thanks to a bard named Symon Silver Tongue, one of the few people to know that Tyrion was sleeping with Shae. 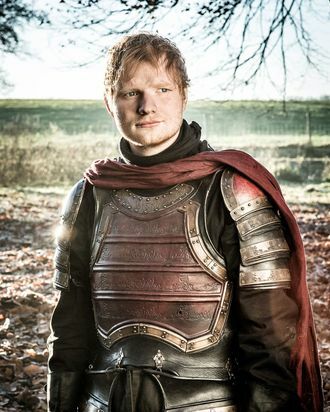 Fancying himself a medieval Carly Simon, Symon composed a thinly veiled song about the affair — “For hands of gold are always cold, but a woman’s hands are warm,” goes the chorus — and threatened to sing it for Cersei unless Tyrion let him sing at Joffrey’s wedding. Tyrion decided instead to have Bronn kill the poor bard and have him thrown in a pot of stew. Not the most pivotal of ASOIAF plotlines, but still, nice to have a reminder anyway. And nice for Arya, to have a few minutes of screen time that were occupied not by murder, but by youthful camaraderie, good cheer, and a few dozen covered tattoos.